Singer / songwriter Emily Kopp will be having a live concert and Q&A session via Facebook live on February 9th at 7:30 PM EST. If you'd like to join the event page or invite your friends you can go here to join. You can also catch up with all the latest and get ready for the show by liking her Facebook page. 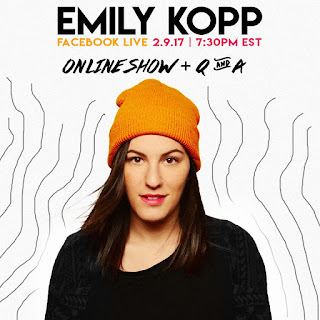 If you aren't familiar with her work I've compiled some of my favorite Emily Kopp videos below. Enjoy, and don't forget to save the date. Free concert right at your computer. Make sure to set a reminder for February 9th and get your questions ready.